No, I’m not Catholic, but this is a good way to observe Meatless Fridays for lent this year. 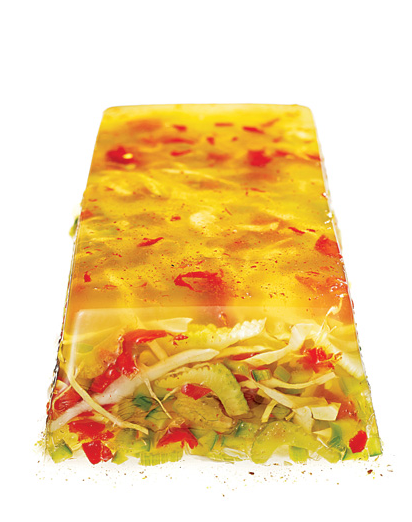 Choosing between canned Ox Tounge and a block of tofu? I’d gladly choose the tofu. Um, dinner tonight in the Nacho Underpants household? Stir Fried Tofu with Black Bean Sauce. 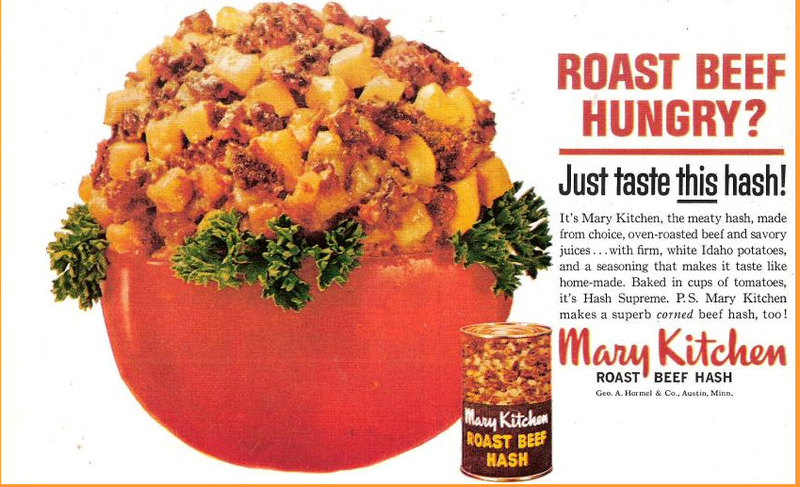 I bet this Corned Beef Stuffed Tomato would be perfect for Valentine’s Day! Give it a try and let me know what your sweetie thinks. 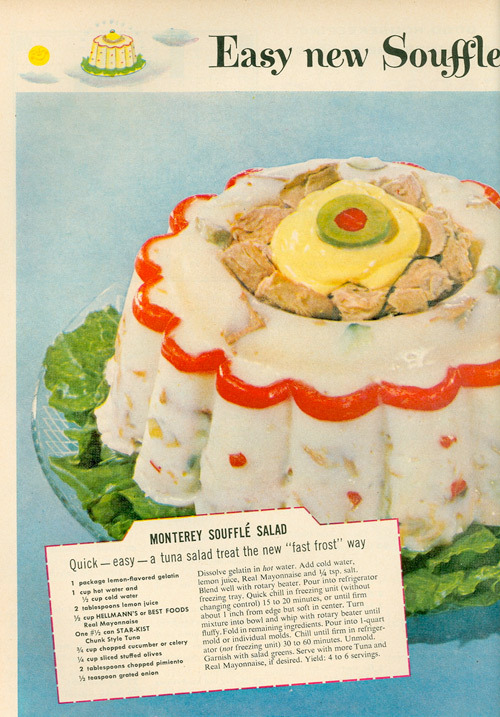 I’m not exactly sure what year this ad ran, but it fits right in with my unheralded obsession with all Disgusting Food Images from the Past. I especially enjoy the crazy flaming sterno in the middle of the star! According to the copy, your guests are supposed to roast the little Vienna Sausages over the sterno! Mmmm.. I can’t imagine how yummy that must taste. Vienna Sausages + Sterno = Instant Glamour. The other two cat food appetizers are Deviled Ham and Potted Food Meat Product spread on crackers. Now, I’m no marketing genius, but couldn’t they have come up with a better name than “Potted Food Meat Product?” You don’t see them calling Spam “Chopped-Pork-Shoulder-Meat-with-Ham-Meat-Added Product” now do you? I’m sure they could sell more of it if they called it PoFo or something. It’s still called that today, believe it or not. 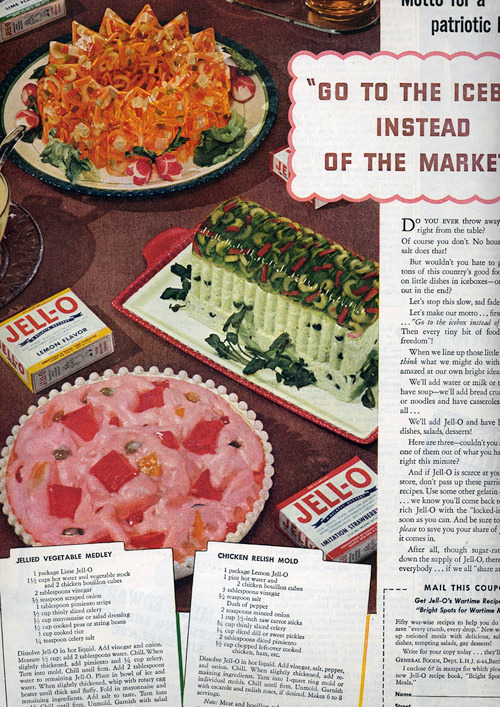 And, even more disturbing is that there are not one, not two, but three different brands of Potted Food Meat Product. Armour brand claims to be #1 in the Potted Food Meat Product category. Why would you brag about this? And, more importantly, who the hell is buying this stuff? 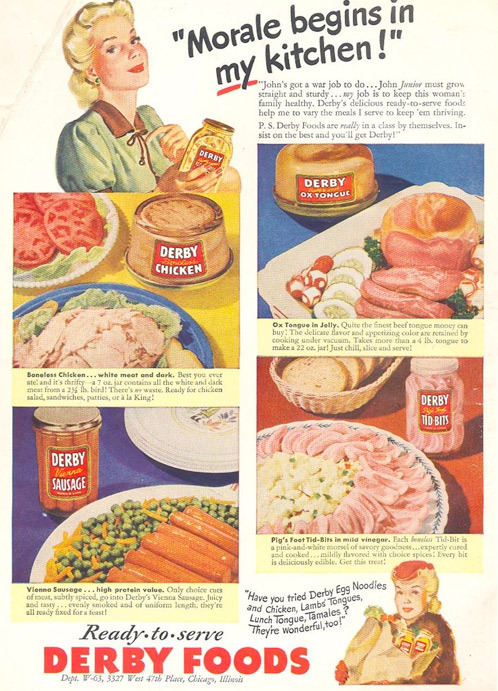 Vienna Sausages, Deviled Ham – it’s all equally disgusting. Oh, by the way, here is the ingredient list to Potted Food Meat Product: Beef tripe, mechanically separated chicken, beef hearts, partially defatted cooked beef fatty tissue, meat broth, vinegar, salt, flavoring, sugar, and sodium nitrite.